2016 Update: Looking for info on the February 2016 Grucci Fireworks show for the Lunar New Year? The fireworks are set for Saturday, February 6 at 8:30pm. Best viewing spots are along the Hudson River near the Circle Line on the NYC side or across the river on the New Jersey side. Download the “Fireworks by Grucci” app on your iPhone or Android and to hear music by Chinese composer Tan Dun that perfectly synchronize with the live fireworks. 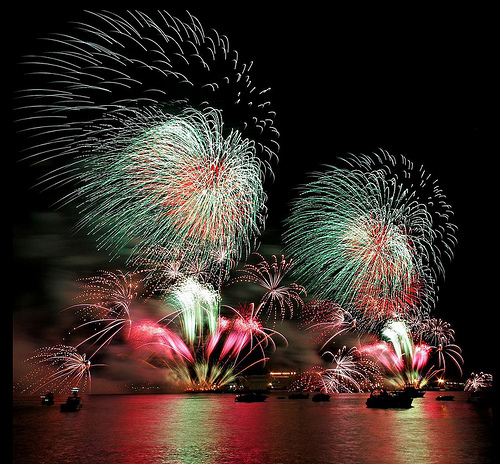 On Tuesday, February 17th, there will be a three-barge Grucci Fireworks spectacular on the Hudson River in celebration of the Chinese New Year. The 20-minute show off Pier 84 (West 44th Street) is scheduled to start between 7:30-8:00pm, weather permitting. The rain/snow date is February 18. According to the event’s organizer, the China Central Academy of Fine Arts, this is the first time in U.S. history that a large-scale fireworks show will celebrate the Lunar New Year and it will nearly equal the iconic Macy’s Independence Day Fireworks Spectacular in scope. “We have joined creative minds and talented teams to really accentuate this remarkable event,” says Phil Grucci, whose pyrotechnicians have choreographed the fireworks to Chinese and Western music recorded by the China National Symphony Orchestra. Tuesday’s fireworks will launch “Happy Chinese New Year: Fantastic Art China,” a series of concerts, art exhibits and community events through February at the New York Philharmonic, Avery Fisher Hall, and the New-York Historical Society, as well as the Lunar New Year lighting of the Empire State Building from February 17-19. 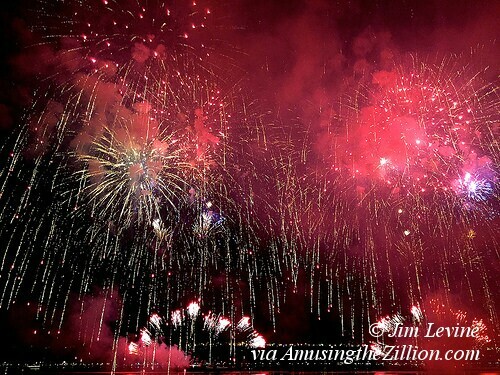 Check out Jim Levine’s gorgeous photos and video of the fireworks here. Thank you, thank you, thank you for posting the details of this fireworks show. Wish I could have made it! Thanks very much for the gorgeous photos!